MORGANTOWN, W.Va. – Physicians at the WVU Heart and Vascular Institute have used extracorporeal membrane oxygenation, or ECMO, to provide oxygen to a patient while she underwent rigid bronchoscopy to relieve complete airway obstruction. This is the first time ECMO has been used in the state to address a complicated airway. 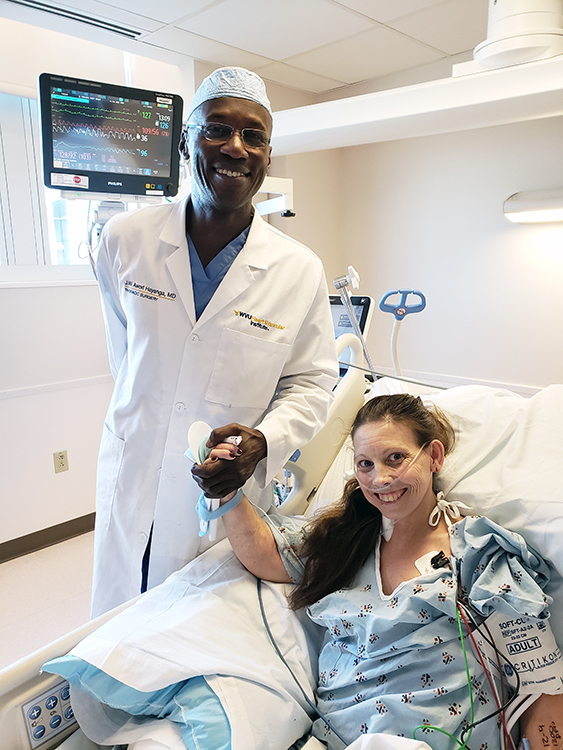 Jeremiah Hayanga, M.D., with patient Misty Dehaven as she recovers from the procedure. According to Jeremiah Hayanga, M.D., director of the WVU Medicine ECMO program, the patient, Misty Dehaven, 34, of Buckhannon,had blockages in her lung due to complications from a combined immune deficiency and congenital pulmonary lymphangiectasia, a rare condition that causes proteins to build up in the airway and impair breathing. Because of a recent illness, the proteins had formed into a cast, blocking her airway and preventing her from taking in oxygen or expelling carbon dioxide, putting her at risk for cardiac or pulmonary failure. In an effort to give Dehaven more time, physicians placed her on ECMO to oxygenate her blood while they performed a rigid bronchoscopy to remove the blockage. Once the blockage was cleared, Dehaven was intubated to give her body the chance to safely recover from the procedure and stabilize her carbon dioxide levels. Dehaven is no longer intubated and is recovering. The ECMO program at WVU Medicine began in 2018, is a high volume center, and is designated a Center of Excellence by the Extracorporeal Life Support Organization. The procedure has helped newborns with meconium aspiration syndrome, people waiting for heart or lung transplants, and patients with certain cardiac problems.